Treat acne scars, large pores, fine lines & wrinkles. What is eMatrix and why are we using it at Eraze? EMatrix is an innovative medical device. Similar to “Fraxel” it uses fractional radio frequency (electrical) energy. Each pulse delivers the radio frequency energy via a grid of matrix spots, inducing skin injury which is maximised in these tiny, targeted areas, in a non-invasive manner in order to stimulate skin repair. 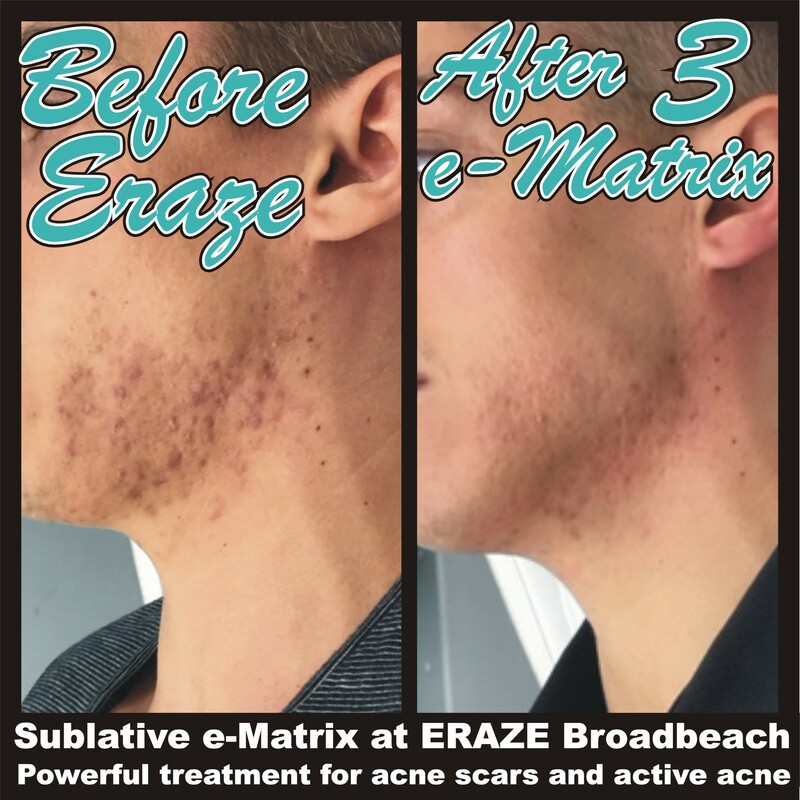 Those wanting to improve the appearance of acne scars, dilated pores or looking for a skin rejuvenation treatment will be pleased with results and our expertise with the eMatrix technology. EMatrix is a technology that has proven safety in all skin types including sensitive fair skin as well as Asian, dark or black skin. EMatrix stimulates skin repair and improves overall skin texture and glow. Pores become tighter and skin texture becomes firmer & smoother. 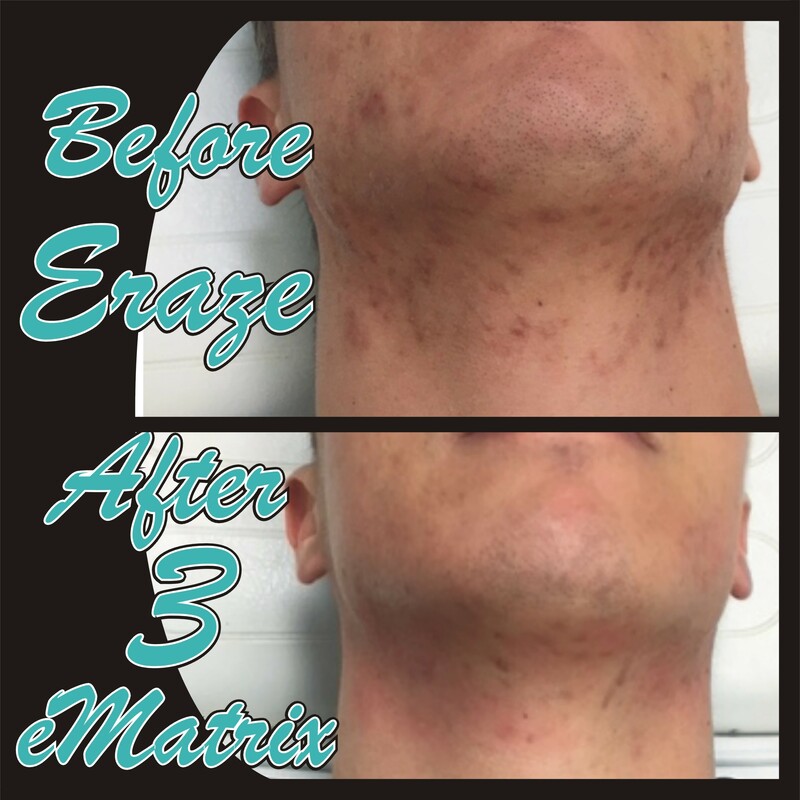 Acne scars improve significantly after eMatrix. Areas of the body most suitable to eMatrix are the face, around the eyes, neck, chest and the back of the hands. Treatments are 15 to 45 minutes depending on the size of the treatment areas. The treatment doesn’t necessarily require numbing cream or painkillers however if you wish to apply numbing cream please do so about half an hour before arriving for your treatment. It’s ok to take painkillers prior to the treatment if you wish also.While under treatment you will experience a mild, short lasting burning and tingling sensation. After the treatment, the effect is similar to a mild to moderate sunburn that subsides within the following 4-12 hours. Expected side effects are redness and swelling after the procedure that lasts from hours to days, and occasionally even up to a week or beyond (very unusual). Normal skin care and make-up can be resumed the following day. Tiny crusts develop and are present for about 5-14 days, but these are easy to camouflage with makeup or even without it after the first day or so. Results will develop over time and with subsequent treatments. Full results can be appreciated at 3 to 6 months following the last treatment. Depending on the severity of the condition, 3 to 6 sessions may be required. The regular interval between sessions is 4 to 6 weeks. The improvement of the skin appears progressively within 12 weeks following the treatment. However, most notice a significant visible improvement even a week or 2 after the treatment. The reparative benefits of eMatrix are considered long lasting and permanent. Therefore, treatment of acne scars will not require to be repeated over time. Those being treated for anti ageing and skin repairwill also benefit from long lasting rejuvenation but may consider occasional touch up sessions for continued prevention. You should not have Sublative Rejuvenation if you are pregnant or have been on Accutane within the past 6 months. In addition, patients with pacemakers, internal defibrillators, or metal implants in the area of concern should not have these treatments. Patients who have diabetes, autoimmune disease, history of cold sores or have had injectable fillers in the area to be treated (need to wait one month after fillers) should let us know prior to having Sublative Rejuvenation.